Inspired by her own granddaughter Natalie, Vice President Joe Biden’s wife, Jill, tells a story through a child’s eyes of what family life is like when a parent is at war across the world. When her father leaves for a year of being at war, Natalie knows that she will miss him. Natalie is proud of her father, but there is nothing to stop her from wishing he was home. Some things do help her feel better. Natalie works with her Nana to send her dad and the other service men and women cookies and treats they have made. Natalie, her mom, and her brother can see and talk to Dad over the computer, and the kindness of friends at school and at church help her feel supported and loved. But there is nothing like the day when her Dad comes home at last. Choose the questions and activities that work best with the age and interests of the child or class you are sharing this book with. This is a story about how a young girl deals with missing her father, a soldier away on active military duty. It celebrates the bravery and patience of military families and the kindness of neighbors and friends. 1. Why do you think the author titled the book Don’t Forget, God Bless Our Troops? Do you think it has any special meaning or tells you something about the message of the book? 2. Do you know any kids who have family members in the military? Are their family members home or serving in another country? 3. Imagine you have a family member in the military—a mother, father, aunt, uncle, or cousin. What do you think that would be like? 4. How does reading Natalie’s story make you feel? 5. Natalie was called upon to be brave. Were you ever brave? Talk about it. 6. Natalie was also called upon to be patient. Did you ever have to be patient? Talk about it. 7. What was the voice that whispered to Natalie, “Be brave?” Do you have any voice inside you? If so, what does it say? Whose voice do you think it is? 8. When Natalie goes to church, she sees her father’s name on a list of soldiers whom people will pray for. Why do you think that made Natalie feel better? 9. Many people were kind to Natalie and her family. What were some of the things they did? What would you do? 10. Do you live in a community where neighbors help each other? 11. When members of our military serve our country, they are often called upon to make sacrifices—to leave their home, families, and friends as well as face danger. Children and families also make sacrifices. How does a family deal with the absence of a loved one serving in a foreign land? 12. This book is based on a true story. Does that make a difference? How? 1. The pictures in this book are very beautiful and expressive. Try reading the book again just looking at the pictures. Do you notice anything new in the pictures or the story that you didn’t see before? How do the pictures help to tell the story? The story takes place over the course of a year. How do the pictures help to show that? 2. This book is based on a true story. Look at the author’s note and jacket copy to learn more about the people behind the story. 3. There is a drawing of a flag by the real-life Natalie on the endpapers of the book. Create a picture of your own for the book. Create a picture or a poster expressing your feelings about our service members to hang on a classroom or school bulletin board or send to a soldier. 4. Members of the U.S. military are deployed in more than 150 countries, including combat zones like Afghanistan. Look on the Internet and find out some of the countries. Find a map or a globe and locate the counties. Choose a country and learn about it and find out why our service members are there. 5. At the end of the book is a list of things schools and communities can do to support military children. Choose one of them as a project. 6. You can also serve your country and community by simple acts of kindness. Do something kind today. 7. Look at some of the websites at the back of the book. Read some of the stories about military kids and families. Look at some of these websites. Learn about Memorial Day and Veteran’s Day. Tips and strategies on coping with new schools and making new friends. The U.S. Army’s collaborative effort with communities to support military children. Provides support to families, features military kid of the month. Links to resources, information, and activities related to the U.S. Government and information about veterans. Links to resources, information, and activities. Learn about the government, with guide Benjamin Franklin. Links, information, activities, coloring, games, crafts about Memorial Day and veterans. A history of the holiday. Links, information, activities, and crafts. List of recipients, stories, links. Medal of Honor Coloring Book. Jill Biden, the wife of Vice-President Joe Biden, has long been a strong supporter and advocate for military families. Her eldest son, Beau Biden, Natalie’s father, was deployed to Iraq two years ago. In April 2011, First Lady Michelle Obama and Jill Biden joined together to start a national initiative, “Joining Forces,” to encourage Americans to join together to support military families in their communities. Jill Biden frequently travels across America and abroad to speak to troops and their families. Second lady of the United States Biden turns her family’s experiences into an earnest picture book that encourages support of those serving in the military and their families. Natalie (inspired by Biden’s granddaughter) misses her father desperately when he is deployed. “Soldiers have to do hard things sometimes,” her mother quietly reminds her. But waiting and worrying about her father, and trying to be a strong example for her younger brother, Hunter, are tough. The words “Be brave, Natalie” appear as a frequent refrain as Natalie, Hunter, Mommy, and Nana celebrate holidays and milestones, wishing Daddy could be with them. Packages, prayers, video chats, and kind gestures from friends and neighbors make things a little easier, but nothing can match the joy of the day when Daddy arrives home to his “brave, brave girl.” Colón captures the rhythms of everyday family life at school, church, and elsewhere in his textured, mixed-media compositions, depicting several tender moments of concern and love among family members. Biden also includes an author’s note, information about the military, and tips for how children and adults can reach out to military families. Ages 5–up. Second Lady Biden delivers a sensitive, non-political account of one family’s deployment. “Does Daddy really have to go?” are the opening lines in this child’s view of deployment, and they are the first words many children say when their parents tell them of the long separation they are about to suffer. "Daddy is a soldier," is the honest answer Natalie has to process. As the seasons change with Daddy still abroad, the difficulty is obvious. Natalie has to be brave as she waits and waits. She is comforted by the support of her neighbors, the prayers of her church, a sensitive teacher, and playing with her “Daddy Dolls” (GI Joes); video chats with her dad are big events. Colón’s soft brush-and-scratch technique invites the youngest readers in, taking a bit of the edge off the sadness but never turning the story saccharine. Each family facing deployment is unique and faces its own challenges, but Biden nicely touches on the experiences that are common to every family: loneliness, fear, long months of boredom and the paradox that life goes on despite the absence. She wisely leaves out the truly difficult moments: the goodbye scenes, the possibility of injury or death, and the readjustment upon the soldier's return. HIGH-DEMAND BACKSTORY: The Second Lady will no doubt attract publicity, and plenty of it. But even on its own, this book is so full of wonderful ways to help the troops that it is a must for libraries. 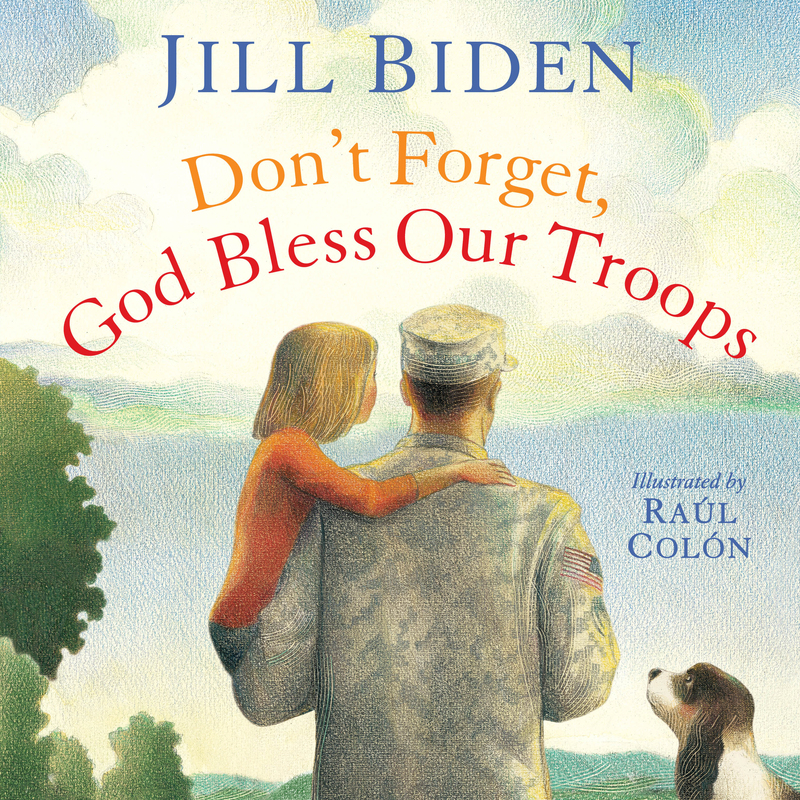 “Don’t Forget, God Bless Our Troops” was written by Jill Biden, the wife of Vice President Joe Biden. Their son is a major in the Army National Guard. This direct emotional connection to the experience of military families permeates the earnest and heartfelt text. But it is Colón’s illustrations that make the small moments — Hunter brushing away a tear, Natalie kissing a photograph of her father in uniform — so deeply affecting. Don't Forget, God Bless Our Troops. Jun 2012. 40 p. Simon & Schuster/Paula Wiseman, hardcover, $16.99. (9781442457355). befriends a girl whose parent is also deployed. Connecting each spread are the words, “Be brave, Natalie.” Through both the sensitive text and the art, there is always the feel of time passing until, finally, Natalie’s father comes home. As always, Colón’s scratchboard-style art, rendered in watercolor and colored pencil, invites a closer look. Here readers will see how faith and community help military families. The excellent back matter gives readers myriad ways that both adults and children can help military families in their own communities. The Second Lady will no doubt attract publicity, and plenty of it.